Introduction : Laparoscopic totally extraperitoneal (TEP) hernia repair is performed in increasing frequency by community general surgeons across the country particularly for bilateral and recurrent inguinal hernias. 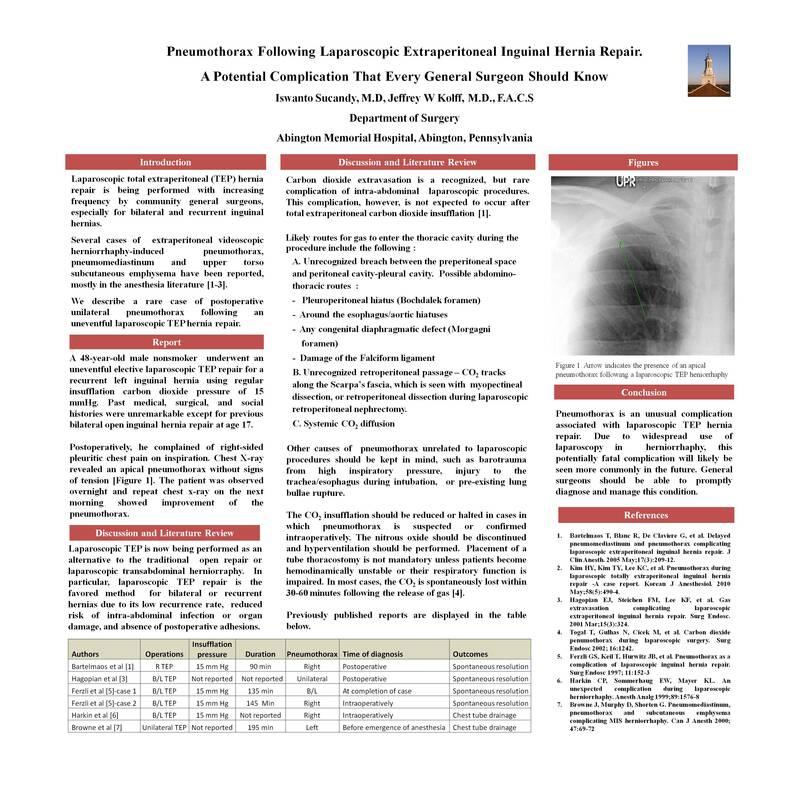 There have been several case reports, mostly in anesthesia literatures on extraperitoneal-videoscopic-herniorrhaphy-induced-pneumothorax, pneumomediastinum and upper torso subcutaneous emphysema. We describe a rare case of postoperative unilateral pneumothorax following an uneventful laparoscopic TEP hernia repair. Report of a Case : A 48 year-old nonsmoker male underwent an uneventful elective laparoscopic TEP repair for a recurrent left inguinal hernia. Past medical, surgical, and social histories were essentially unremarkable except for a previous bilateral open inguinal hernia repair at age 17. Postoperatively, he complained of right sided pleuritic chest pain on inspiration. Chest-X-ray revealed an apical pneumothorax without signs of tension. The patient was observed overnight and repeat chest-x-ray on the next morning showed improvement of his right pneumothorax. Previously reported cases and possible pathophysiology are reviewed. Conclusions : Pneumothorax is an unusual complication associated with laparoscopic TEP hernia repair. Due to widespread use of laparoscopy in herniorrhaphy, this potentially fatal complication will likely be seen more commonly in the future. General surgeon should be able to prompty diagnose and manage this condition.